To fulfill our philosophy, The Learning Pavilion has adopted the Creative Curriculum. This curriculum embraces sound research and theory. The Creative Curriculum emphasizes the role of the child, the teacher (or caregiver), the family and the community. No one piece is more important than the other. for young children age birth through kindergarten. Creative Curriculum builds in daily assessment opportunities using Teaching Strategies Gold so that adults working with young children to assess and scaffold children’s development. The research and longitudinal follow-up supporting this curriculum has shown that when children successfully master the stages of play, they are developmentally guided toward success in reading, writing, and math skills. Our program is a support system for children and their families. Staff are carefully selected based on education, training and experience, and classrooms are individually planned to meet the unique needs of each child. Classrooms provide a multitude of play opportunities through which each child is guided towards his/her optimal developmental level. 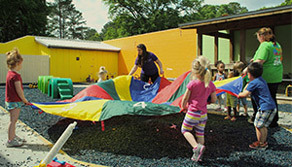 We use the Creative Curriculum, which is play-based and designed to provide a loving, playful, and stimulating environment. 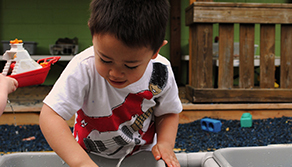 Play environments are organized into centers which are designed, equipped, and arranged to promote the child’s development through sensorimotor, dramatic, fluid/messy play and structured construction play experiences. 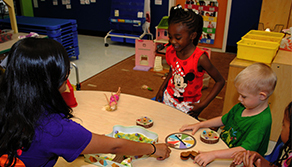 Staff are focused on each child’s development of self-esteem and personal independence. Children are encouraged to make choices, think independently, and to build trusting, cooperative relationships with peers and teachers through an environment that is child initiated, child-directed and teacher- scaffolded.